Baden Archibald belongs to Vlad Zdrale's mother near Tivat in Montenegro. Vlad is also living in London. Here are some pictures of Archibald. He is such a cool character. At 3months and 10 days he weighted over 18kg. Can you please forward these picture to your friend in Holland (she asked for them). Send her my regards and thanks for helping with information. Small puppy (still I did't give her a name)arrived July 2004. She is wonderfull like Bantu been or like every dog from your kennel. Next week I will transfer the money for you. This is Robert from Hungary. As I promised you will find enclosed pictures from my magnificiant boerboel Bantu and lovely staffordshire terrier Szaffi. This pictures was shoot at the middle of December 2002. Actually Bantu is bigger than that time. Hi is growing up like lion. Thank You for information. We have named puppy Thor. Find the attached photo, please. On the picture from left to right: Leon (Rhodesian Ridgeback, 20 month old), Eugenia (my wife), Thor and me. Koko got her first checked up and the Vet gave her an excellent health report. She weight in 27 Pounds at three months. Koko made us so proud when there were couple of older dogs tried to dominated her, she remained calm like it was nothing and was not intimidated by it. 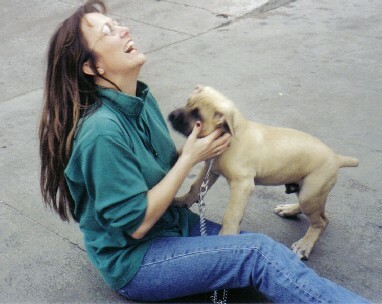 Everyone was so impressed with her size, temperament, and every true character of a Boerboel. Thank you & please keep up the quality work. The attached photos are Koko at three months with my children and we've received many compliments of her. Attached is an updated picture of Baden Java...he is doing great! 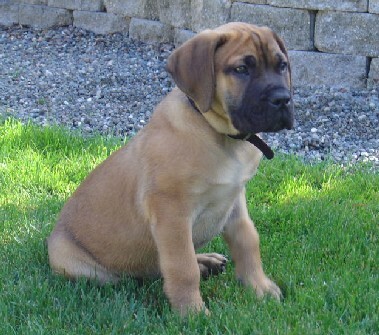 Everyone loves him and he is an excellent ambassador of South Africa and the Boerboel Family. He is 3 months old in this picture and is weighing in at 20 and 1/2 pounds. Baden Java is a doing great! He is perfectly healthy and is all puppy now. Everyone in the neighborhood loves him and the kids next door keep coming over to play with him...he is awesome! Attached are a couple of photos for you. My wife April and Java (first day after his frist bath)...the second photo is Baden Natalia and Baden Java in our house (I saw the picture of Baden Natalia on your website...I took the picture)..and the third one is just Baden Java. He is the center of our world right now..
Baden ...... belongs to Carol Boudreau of Canada. Just a quick note to let you know the puppy made it to Canada okay. He is wonderful!! Please see the photo attached of him once we got home. Baden Diego belongs to Diane Becker of Los Angeles. "I have also attached a couple photos from LAX when I picked up Diego. As you can see he was a little unsure in the picture by himself, but did not take too long to warm up to me as soon as I got down to his level! I love my dog!.............. he is a wonderful dog! Very spoiled and getting bigger by the minute. He has been sleeping on my sons bed with him at night, I think we may have to get a bigger bed to fit the two of them!! 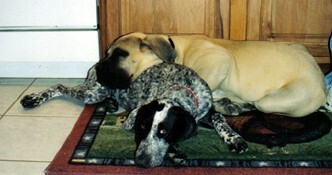 The picture I have attached is of Diego and our friends' German Shorthair Pointer (a month older than Diego). As you can see he is very well adjusted around other dogs." own son! This muscular little boy is very healthy, happy since the first day here! He was much stronger than what I expected! I can tell he is very loyal to our families even in this age. 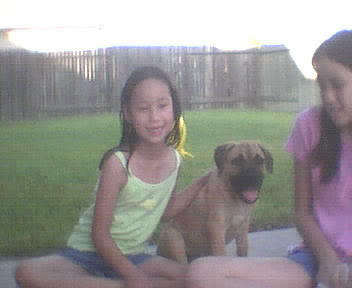 I greatly appreciate for bringing Jumbo to my family!